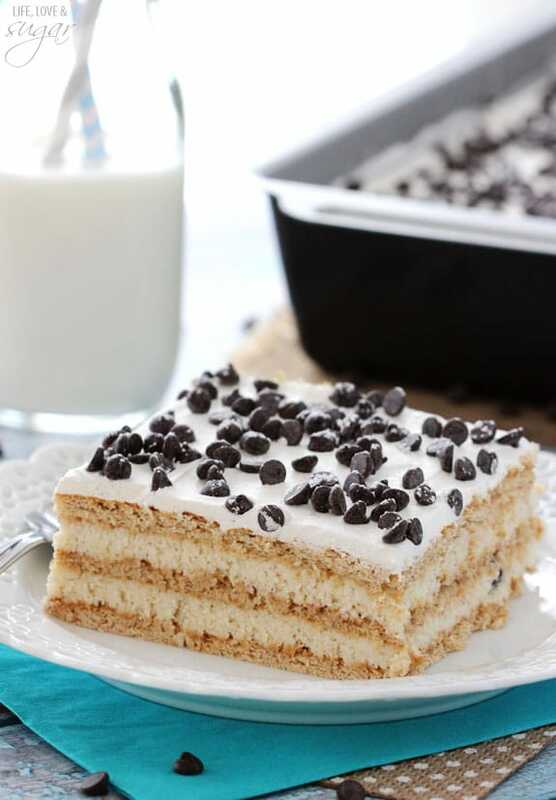 This Cannoli Icebox Cake is so simple to make. 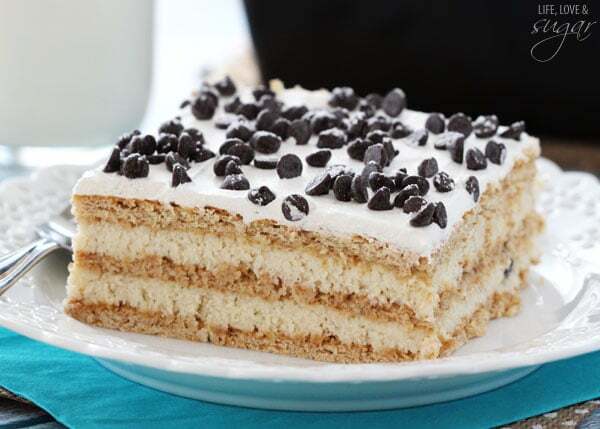 With layers of graham crackers and cannoli filling, it makes a delicious and easy treat! We had a pretty uneventful weekend. It was busy and full of plenty of baking, but not particularly exciting. And yet, sometimes those are the weekends I love the most. The hubs and I enjoyed some nice time together. Our church actually streams the 11 o’clock service online and we decided to stay home and watch church from the comfort of our couch. After the weather has gotten into the 70s lately, it was in the 20s yesterday morning. Instead of braving the cold (we’re wimps, I know), I made us a nice warm breakfast and then we watched church. It was really great message – you should totally check it out. It was about how God uses difficult times in our lives to help us learn and grow and depend on him more. It’s a message that the hubs and I could not related to more. We’ve learned and grown so much over the last several years. We’ve had our share of difficult things, including our fertility struggles, and we know God’s been with us through it all. We continue to trust that he’s got a plan for us and the family we hope to have one day, so we loved the message. 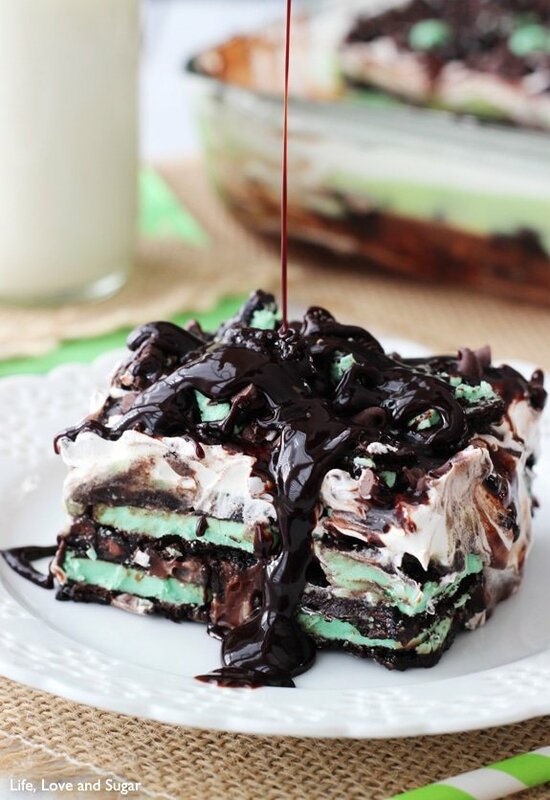 We also love icebox cakes. You can do so much with them. 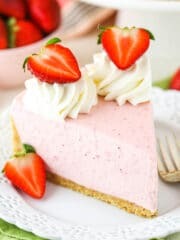 I’ve made several different flavors (Strawberry and Blueberry Cheesecake Icebox Cake, Mint Oreo Icebox Cake, Funfetti Birthday Cake Icebox Cake), and this is one of my new favorites. 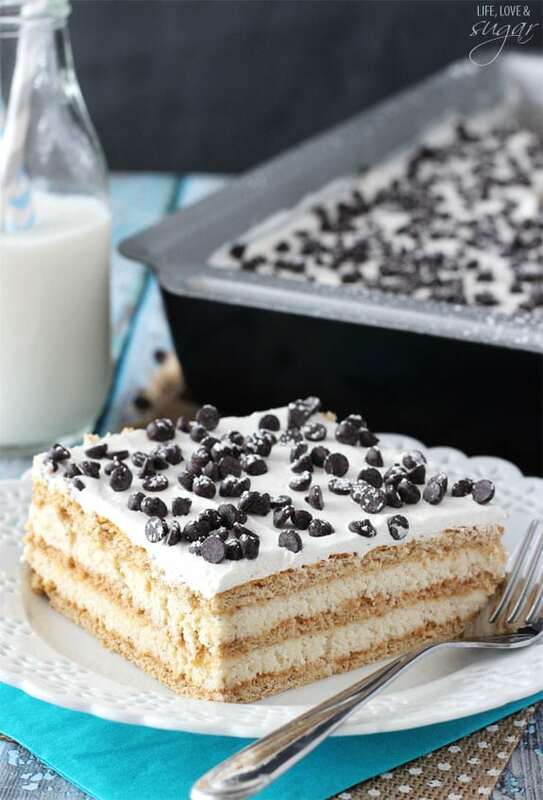 After making my Cannoli Poke Cake last year, I love using the flavors of cannoli’s in dessert. 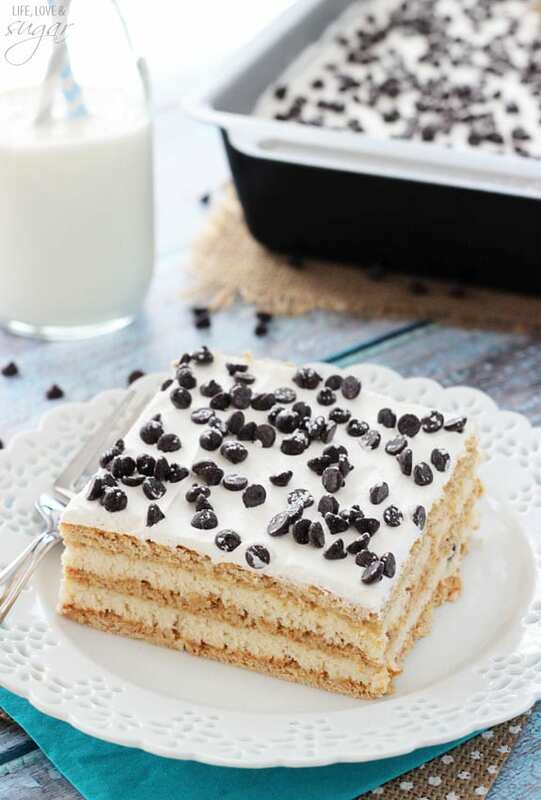 In this icebox cake, the flavor is light and sweet – but not too sweet. 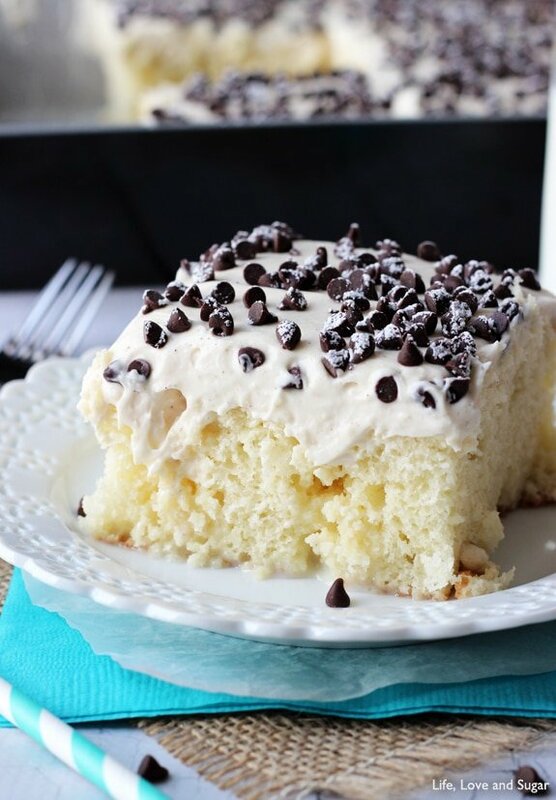 In fact, it’s a little less sweet than the poke cake, which makes sense since there’s no sweetened condensed milk in this recipe. The graham crackers act like the shell of a cannoli and the filling is cannoli filling. 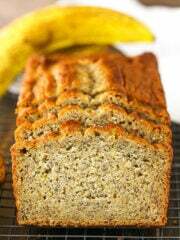 So simple, but so delicious. 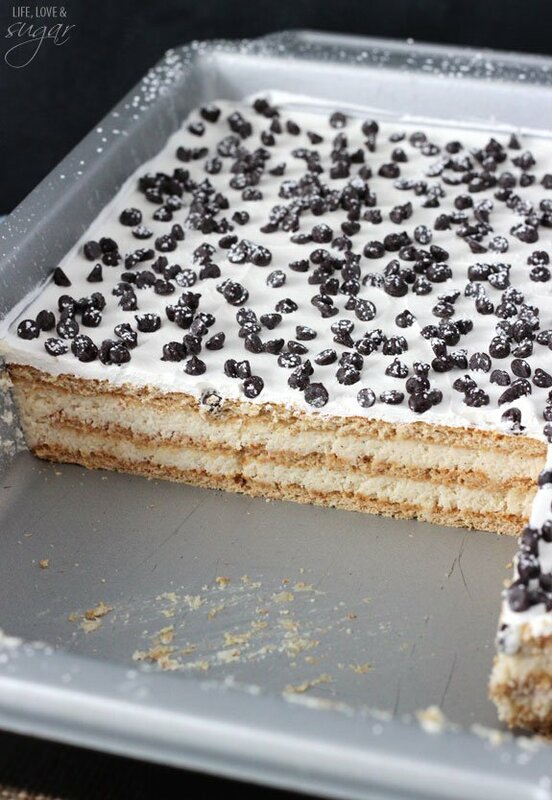 A great way to eat a cannoli without all the work. I only used mascarpone cheese in this filling, though some cannoli fillings use a mix of mascarpone and ricotta. Ricotta can tend to have a lot of liquid in it, so I avoided it in this recipe. You can substitute half of the mascarpone for ricotta though, if you’d prefer. You’ll probably want to drain the ricotta before using it. 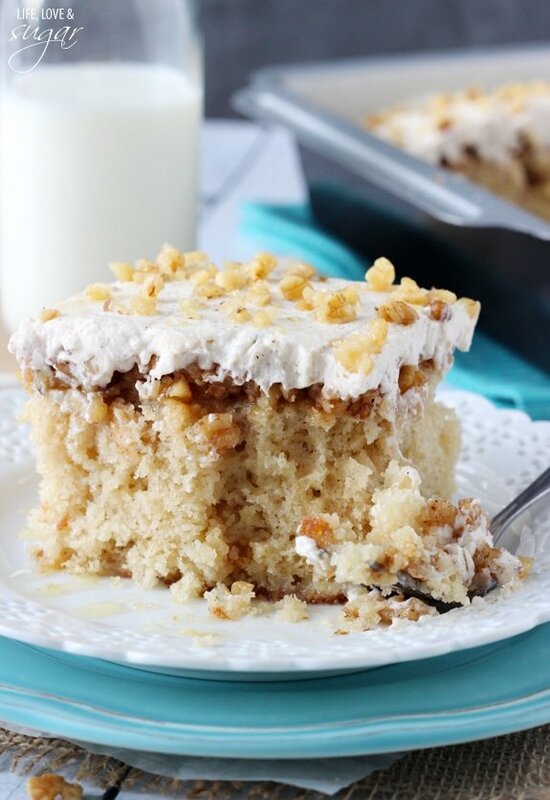 One thing I thought might be fun to try in this icebox cake is cinnamon sugar covered graham crackers. 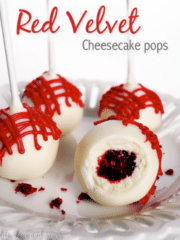 I used regular ones, which were delicious, but if you wanted to sweeten it up a bit – which you know I love – that’d be a fun option. 1. Beat mascarpone cheese, powdered sugar, cinnamon and vanilla extract until well combined. 3. Put a single layer of graham crackers in the bottom of a 9×13 pan. You might have to break some to fill in the gaps. I used about one sleeve per layer (there were 3 sleeves in the box). 4. 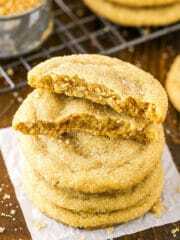 Top graham crackers with half of the mascarpone mixture and spread evenly. 5. Add another layer of graham crackers. 6. 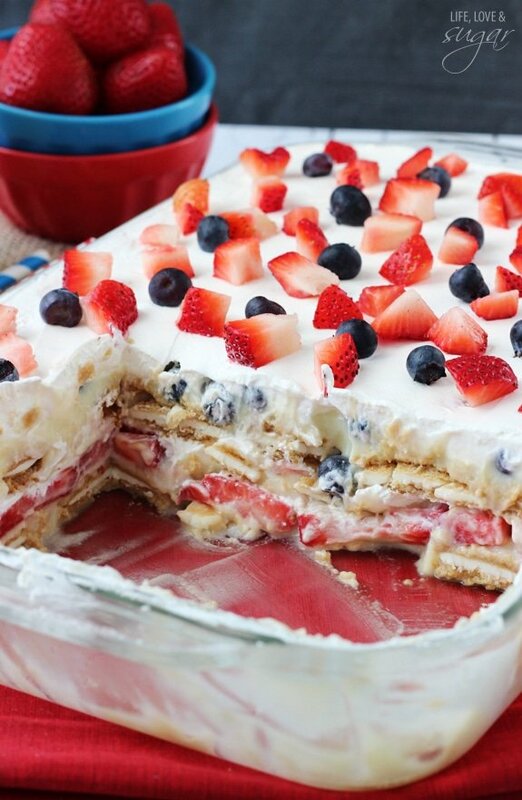 Top with the other half of the mascarpone mixture and spread into an even layer. 7. Add a third layer of graham crackers. 8. Top with remaining half of Cool Whip and spread into an even, thin layer. 9. 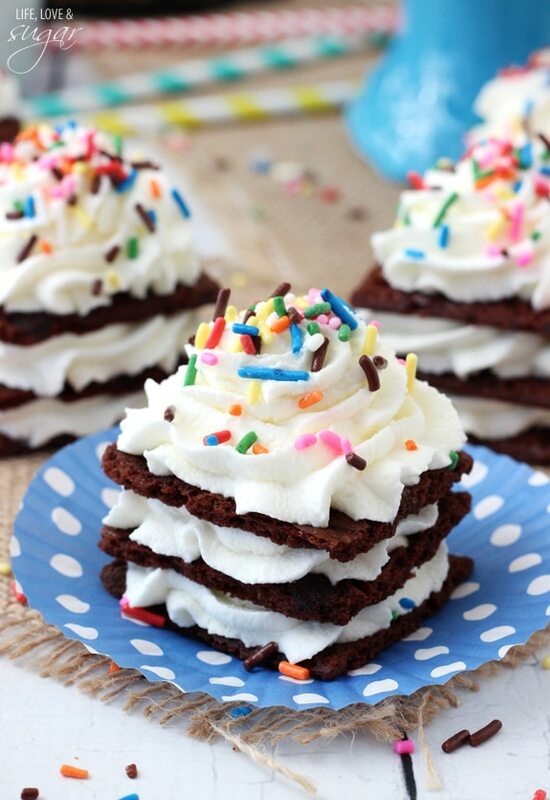 Sprinkle the mini chocolate chips over the top of the Cool Whip. 10. 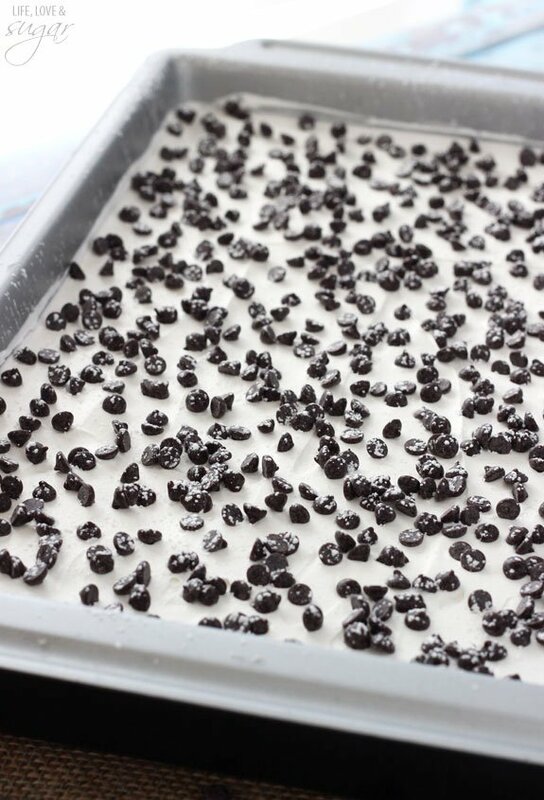 Refrigerate 5-7 hours, or overnight. The longer it sits, the more time the graham crackers have to soften. Dust with powdered sugar, if desired. 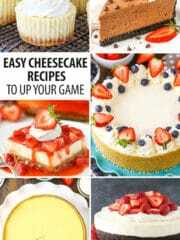 *Can substitute half of the mascarpone cheese for ricotta, if desired. I’d recommend straining the ricotta. Wow, I wish my place of worship streamed sermons for me to watch. That would be a lot more convenient! 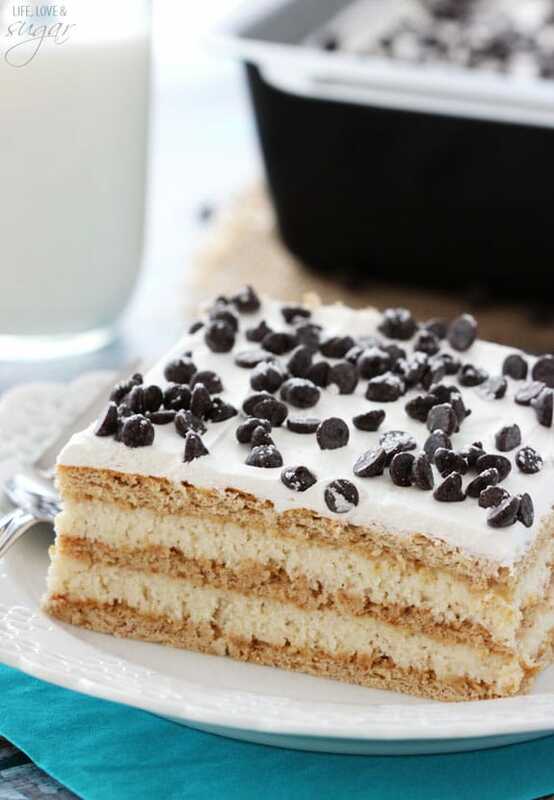 I love the idea of deconstructing cannoli into an icebox cake! This looks seriously amazing. 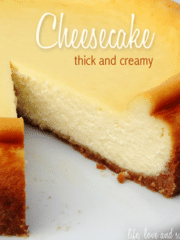 Love that you used mascarpone cheese in this recipe! It looks amazing! 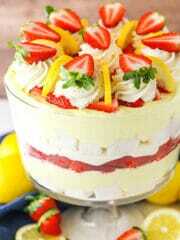 This is my kind of dessert! I love this new twist on cannolis! 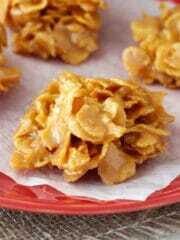 I love the twist you put on these, yum! Yum!! Anything cannoli-related is right up my alley! Can’t wait to try this! 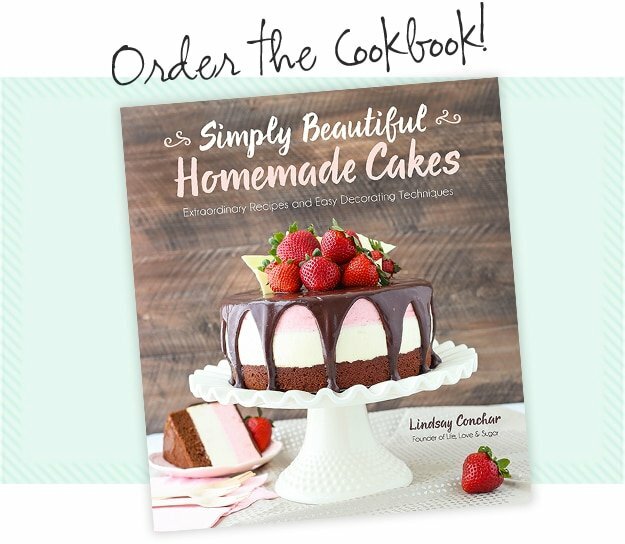 My husband and I LOVE cannolis, and in cake form, this is a must for us! Honestly, I would live stream church every Sunday if I could sit home in my PJs :), but I am so glad that the topic this week was what it was. I think you and Ian are so strong to go through what you are going through! 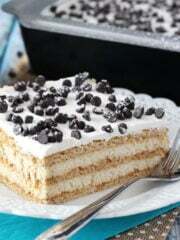 Also this icebox cake. Genius. Thanks girl! You are the best! What sermon were you refering to exactly? They all sound good. But, I’d like to hear the one you mentioned. Here is the link. It’s called “Even when it hurts”. 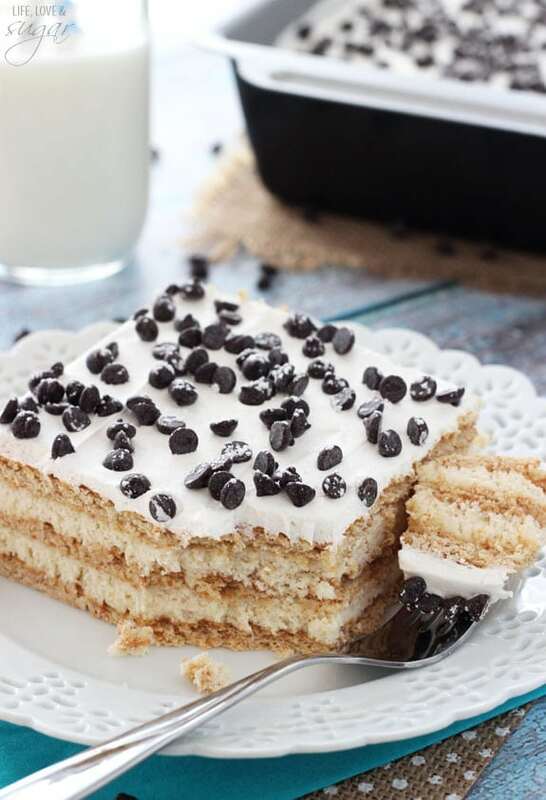 Do you have a good source for mascarpone? 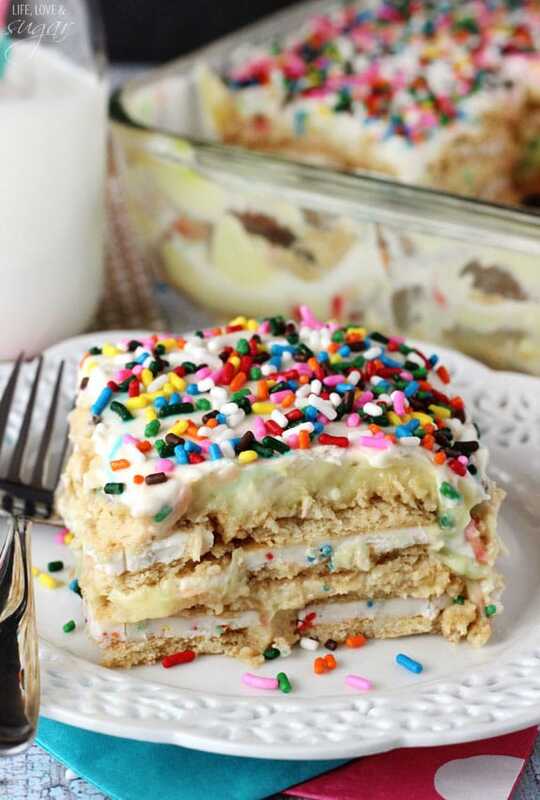 My store sells 8 oz for 4.99, so to make this with all mascarpone would cost $20 just for that ingredient alone. Even if I substitute 1/2, that’s expensive! Are there any other substitutions you can make? Yea, it does tend to be more expensive. You could try using ricotta, but you’d want to be sure to strain it first, since it can tend to be watery depending on the brand. if I make this Tuesday will it be good in the fridge till Thursday to serve or is that too long? Yes, it’ll still be great. 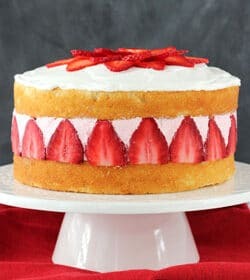 I just finished making this cake, super easy but only used 3-8 oz. pkgs. 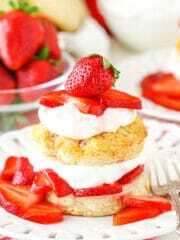 mascarpone. 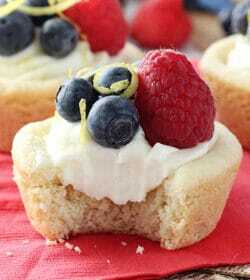 Added dash of cream as thick even with whipped cream added. Had a few graham piecess left so put in processor & added over top Can’t wait to see if it comes out neatly when serving.That seems to be a problem area.